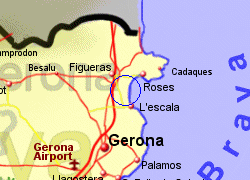 The small town of Sant Pere Pescador sits on the banks of the river Fluvia, 2Km inland from the centre of the Bay of Roses, on the Costa Brava. 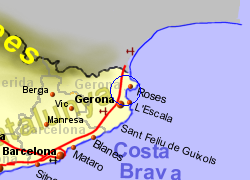 The surrounding area was marshland until it was drained in the 18th and 19th centuries and is now fertile agricultural land (mostly growing fruit trees) with the Rio Fluvia meandering through it (50m wide as it passes the town). 5Km north of the town you will find the Natural Parc dels Aiguamolls de l'Empordà, a natural wetland demonstrating how the area looked before drainage. While the main tourism asset is the proximity of the 7Km golden sandy beach backed by sand dunes and popular with wind surfers, the town also has a selection of bars and restaurants, shops, and banks. 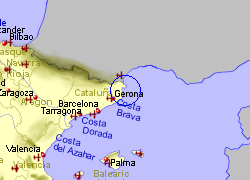 Map of the Sant Pere Pescador area.